Hi! My name is Amy Hughes and I am a 35-year-old, married ten years last week to the most amazing man. I couldn’t have chosen a better husband than Brandon. 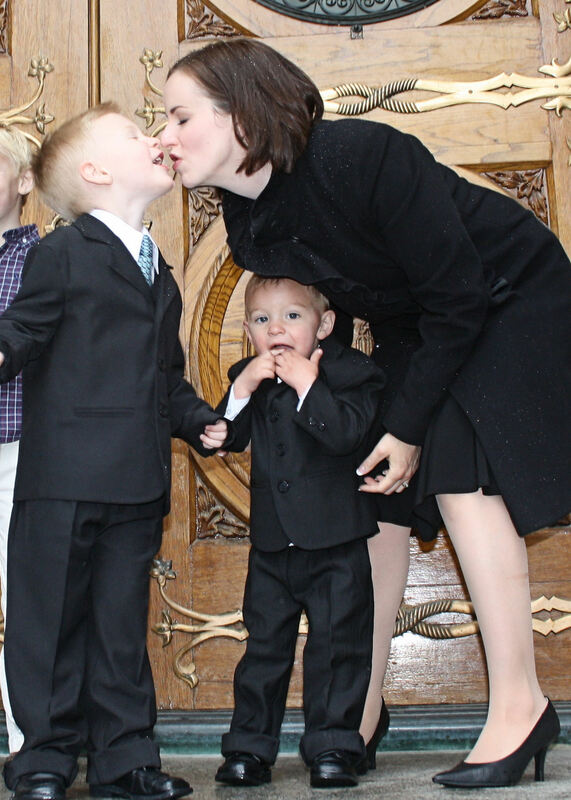 I am the mother of two little boys that I couldn’t imagine living my life without. Kaalam (KAY-lem) is four and a half years old and he is the sweetest, kindest, most polite little whirlwind you’ve ever met. He never stops! But he’s nice, so it could be a lot worse and that makes up for a lot. Xander (Alexander) turned two last week and is the polar opposite of his big brother. He’s quiet, with a devilish sense of humor that I know is going to be dangerous in a few years and he hardly ever speaks a word. He can. He just doesn’t want to. While Kaalam is outside learning stunts on his bike, Xander is happily curled on the couch reading a book. But the two of them somehow fit together in the most beautiful way. I love to watch them be together. I am so grateful to get to be a mom! For a very long time it looked like I’d never get that chance. I started life as a BYU baby, but I was raised in Canada. I was the second oldest of 6 children and the first of five of us in five years (no multiples). I had one sister and four brothers and because we were all so close in age, we basically grew up in a pack. Being surrounded by so many brothers meant that I was a tom-boy then and I’m still learning about how to have girly friends now. It’s a skill that I’m trying hard to develop. I lived in Lethbridge Alberta until I graduated high school, moved away to Provo for a couple of years and I haven’t really been back since. I served a mission in Las Vegas Nevada where I learned that dry or humid, 126 degrees is just too hot for any reasonable human being to withstand. I have companions that have moved back to Vegas and I have to admit that I really don’t get it. I loved the work, I loved the people, but I was not made for that kind of heat. Give me a winter I can bundle up against any day! And I say that having experienced -70 degrees. Not that -70 is comfortable either, but if I had to choose. Educationally, I’ve had a long and random history. I worked as a veterinary technician for a couple of years before my mission. After my mission I studied Herbal Medicine for a year, ran out of money and got married. My husband then convinced me that if I couldn’t be learning how to use the plants, I could at least learn how to grow them so I got a degree in Landscape Design that upon graduating I decided I didn’t want to have to use. It was a heat thing. I don’t like doing landscaping work outside in the heat 12 hours a day. After a break from school to renovate a house, we were still childless and I wasn’t sure what else to do with myself so I went back to school again. This time for an English degree. Though I think I may have taken more psychology and history classes than English. I was halfway through this last degree when we were finally able to adopt our first son. I’ve been at home ever since. In the last 16 years I’ve lived in 2 provinces and 5 states and though we’ve recently landed in Utah, we don’t think it’s where we’ll stay. Which makes both of us sad. We never thought we’d choose Utah, but it’s felt like home faster than any other place we’ve been in the last few years. I hope we get to stay for a while. My favorite part of being a mother has to be that I get to be one. I really thought I was going to answer this question with housecleaning, or laundry or something but this Sunday I realized that I was wrong. If I could subcontract out just one thing, I think it would be Sacrament meeting. You know that scene in Shrek2 when they’re in the carriage on their way to Far Far Away and they can’t get Donkey to keep his mouth shut for more than 10 seconds at a time? I realized with some degree of horror this week that Donkey is my son. I’m raising Donkey. My two-year old will walk into Sacrament, sit himself down on the bench with his arms folded and listen quietly through the whole hour. But I have a feeling he’s only doing to make his brother look bad. My four-year old is physically incapable of sitting still or shutting up for more than 10 seconds at a time and if I could pay somebody to deal with him through that hour I would jump at the chance. Unfortunately it’s the Sabbath and we aren’t supposed to cause others to work so I’m stuck with him. Someone shared a quote this week about gauging your spirituality by what you think about during the sacrament. I’m sure it was a prophetically inspired quote, but I’m thinking there’s got to be some degree of leeway for mom’s with little kids. If there isn’t then I hope I don’t die until they’re grown. I would love to be a published author. I went to a writing camp with Orson Scott Card a couple of years ago and I impressed him. I made him like a story in a genre than he has despised his entire life. Then he tore my work into little pieces anyway because that’s what we were there for. But it gave me the confidence to know that I really can write. If only I had the time in which to write. I’m good at most things I try. And I hate to say that because I know it sounds really awful, but really there are few things that I’ve wanted to try that I haven’t been able to master. My biggest problem is that I’ll try something, get really good at it, then get bored and go look for something else to do. So I’ve done nearly everything at some point of another. Right now I’m designing knitted hats to open up an Etsy shop in the fall. We spent the week at my in-laws house and apparently I’m a nervous knitter because I came home with 7 finished hats in a single week. 5. Do you have a favorite scripture or quote? Why? “If all men had been, and were, and ever would be, like unto Moroni, behold, the very powers of hell would have been shaken forever; yea, the devil would never have power over the hearts of the children of men” (Alma 48:17). First off, my little teenage heart fluttered over the Captain Moroni in the seminary video the first time I saw it. But it also reminds me of the kind of sons that I’m trying to raise. The world needs Moroni’s now more than ever and if my sons are going to make it through this life, they need to be Moroni’s themselves. This scripture helps me with my perspective on days when I can’t remember why I’m doing what I’m doing. 6. What do you gravitate toward during your unscheduled time? Reading mostly, and crafting of any kind. I knit and sew and scrapbook and I’ve recently started making cheese. (Random I know!) I love to sink my hands into the dirt and we recently built a raised vegetable and herb garden that is way bigger than it needs to be and I can’t help but head outside at every opportunity to just wander through it. 7. Tell us some of your best mom-tricks (things you’ve figured out that work well for you). Routine! Routine! Routine! My older son especially, the one with “high-spirits” is a different kid when he knows what’s coming. If he can understand what the day is going to look like, then everybody’s day goes smoother. Which means sometimes that every half an hour I’m needing to go back over the list with him explaining that we’ll do this, and then this, and then that. And he’ll keep track for me. If I forget to talk to him, to let him know what’s coming, I generally end up regretting it. 8. What’s something you don’t usually want people to know about you, but that they need to know if they’re going to be your friend? I am incredibly shy. I don’t present that way. My mission taught me the art of being able to look a person on the eye, ask a few personal questions to get the other guy talking and then not have to say anything for the rest of the conversation. It’s usually pretty effective. Sometimes not. But no matter how forward I manage to make myself seem, inside I’m quivering and my mouth is trying to sew itself shut from the inside while my brain helps out by shutting down entirely. If I had my way, I’d sit quietly in the corner, listening to everyone else talk for a few hours. Once I get the feel of things, then I can open up, but I really hate having to be the leader in a conversation with someone I don’t really know. 9. Friends are great for venting. What’s been frustrating you lately? My four-year old, Kaalam. He’s the kind of kid who’s been getting ADD comments since he was 18 months old. A hundred years ago people would have just compared him to Huck Finn or Tom Sawyer, called him “all boy”, wished me luck and congratulated his dad for having a boy with such “high spirits”. He is so sweet, and so kind, but he’s impulsive and he never stops moving or talking and he doesn’t just mimic the emotions of those around him. He magnifies them. School starts in a year and I’m scared to death. 10. What parts of your testimony are you the most sure of? I think the part of my testimony that I’m most sure of is that God is watching out for me and that he has a plan. I might not be able to see it, but there is definitely a plan. Several times in my life I’ve been asked either through inspiration, or through priesthood blessings to just up and move away, or to make changes in my life that I had no reason to make other than being asked. Right out of high school I was told to leave Canada and go to Provo. I wasn’t a student and I had no reason or desire to be there. I went anyway and was put in the position to eventually receive instruction through a priesthood blessing that I needed to serve a mission. I was dating seriously and that same weekend the prophet spoke in priesthood meeting about women not being required to serve missions because it was a priesthood responsibility. I’d always wanted to go, but I didn’t want to go at the moment. I went anyway. After my mission I was on a flight to Texas from Ontario Canada and had an absolutely shaking experience telling me to move to Colorado. I’d never been there before and it was a big state with no concrete reason for me to go. Within three weeks of moving there I met my husband. After that it was California, and now Utah. And this is really the very, very short version of the story. Every single time the Lord has asked me to jump, I’ve jumped and every single time, he’s caught me. Every move has led to growth and development and change and it’s all made me so much better than when I started. It’s to the point that I’m afraid not to listen to that inspiration. If I’m asked to put myself somewhere, I show up. 11. Desert Island Question. If you were stranded on a desert island (most moms would actually crave this) and could only take 3 items with you, what would they be? A fantasy novel, or maybe some Ray Bradbury (Something Wicked This Way Comes is my all time favorite!). My knitting. It sounds dorky, but it’s terribly relaxing and I’d love to actually start something and then finish it without interruption. 12. What’s something unexpected in your life, and how have you dealt with it? The first thing that comes to mind is our infertility, but I’m not sure it was completely unexpected. As early as high school I was thinking about adoption and on my mission I couldn’t shake the thought that someday I was going to have problems having children. Which was a mercy I think, because I was at least a little bit prepared for it when it happened. I’ve been through a lot of things in my life, some of them pretty scary, but nothing has ever or could ever compare to not being able to conceive. I’d lie awake at night praying, begging for a miscarriage, just so I’d know that my body could make something happen, anything happen at all. Ten years into our marriage, the doctor’s still don’t know why we can’t get pregnant. I’d like to say that I handled it all with grace and faith and an unswerving belief that everything was going to be OK, but it wouldn’t be true. I ran the gamut of hopelessness and despair and anger. I hated God for a while for giving me the commandment to procreate and then not letting me fulfill that commandment. I came to see hope as vicious. Every month that went by, no matter how I tried not to I could never escape the hope that maybe, maybe it would happen this time, only to have hope crushed again. It’s an unending cycle that there really isn’t any escaping from. When we were finally approached by our birthmother, the worst of the anger already had passed and I’d finally gotten to the point where I could mourn the loss of the child I was never going to have but it wasn’t until our second child was born that I was able to let go of the sadness of not being able to be pregnant. I was finally able to look back and see things as they were. It didn’t feel like it at the time, but the hand of the Lord had been there the whole time. A string of small miracles (and a few very big ones) that could fill pages had all been lining up to build me the family I wanted so badly. And in the end, standing in the temple with my two sons, looking in at the Celestial room with them and being able to hold their tiny little hands at the altar as they’re made a part of my family forever was worth every moment of what it took to get us there. I have a stronger testimony and understanding now of the purpose and the importance of temple than I ever thought I could have. Having come through, being able to see the whole, I would do it again. My family blog is Hughes News – http://amybrandonhughes.blogspot.com/. Mostly it’s pictures of my kids with the occasional personal thought thrown in. I tend to do more of the personal thoughts writing when we’re in the middle of adopting. There’s a lot to think about and deal with when you’re trying to adopt and I tend to use the family blog as a way of sorting through everything that’s going on in my head. It’s been neglected a little bit in the last few months since we’ve moved to Utah, but with life settling down at last that’ll change pretty soon. And we are starting the adoption process for a third time, so I’ll be having everything to think about and sort through again. My slightly less neglected blog is I Hear Exercise Will Kill You – http://ihearexercisewillkillyou.blogspot.com/. A few years ago I decided I was tired of being 35 lbs overweight and tired of feeling tired all the time. And we found out we were adopting our second son. I was terrified of the thought of trying to keep up with two kids with Kaalam’s energy level and decided I’d better be ready. So I started my blog to help me focus my way through. By the time Xander was born I was 30 pounds lighter and never felt better in my life. And I’ve kept it all off ever since. Mostly it’s a place to post healthy recipe’s and recently a few stranger things like homemade deodorant and sugar and milk body scrubs. I’ve been studying herbs lately and I expect that a lot of that will start sneaking its way into the blog too. I seriously feel like I really know her now! Thank you, Amy. So fun to “meet” you more. Give Amy a hello, or share some common ground with her in the comments below or over at her blog. Have a great weekend everyone! I am impressed with your example of faith, obedience & endurance. I totally believe that spiritual growth comes through trials and obedience. When we come to accept that life is full of hurdles (some much taller than others), and with Faith in God, nothing is impossible. Thanks for sharing your thoughts, Amy! I, too, have a very spirited son [though I think I may have another on my hands 🙂 !!] … I was dreading him starting school, but we were blessed with an AMAZING kindergarten teacher. My son truly blossomed in school and had a stellar year! Yes, he is still his wild and spirited self at home, but at school he did fabulously!! Having someone else handle sacrament meeting? Genius! I can’t even imagine what a relief that would be to my brain. And, also, my own husband has ADD concerns about our four year old. He’s just being a four year old, boy, I argue — he’s normal! I have a 4 & 6 year old who are both high spirited and I have gotten a few ADD comments, mainly at church…which I actually get ticked off by it, I know I really shouldn’t as I know it’s because my children love wide open space & go slightly nutso in the church building’s long hallways and large open rooms like the gym. My 6 year old just finished Kindergarten. Back in September when his teacher’s told me how polite and well mannered he was, I couldn’t help but ask, You are talking about my child right? Really I wouldn’t be worried the structure and routine of school does amazing things! Good luck with Sacrament meeting, I remember how crazy that was with my family 🙂 You guys are wonderful all the same! I love it. A friend and I decided that some week we’re going to leave the kids with our husbands, and go sit on the other side of the chapel, just so we could remember what sacrament meeting feels like! It’s great to meet you Amy, and I’m so impressed with you and all the awesome things you do. I’m excited to visit your blogs and get to know you better! Summer is really throwing my blogging off! Since I’m not blogging-I am missing a lot on other peoples blogs too. I missed meeting you last week Amy but I am glad I came back and read this now. It sounds like we have a lot in common. 🙂 Can’t wait to check out your blogs! Ummm. can I just say that I so agree, I would totally let someone else take my 4yr old and for sure my 2yr old to sacrament meeting, Sundays tend to be super hard for our family but that hour is the LONGEST hour EVER! !